Phyllis Drake, age 80, passed away on December 30, 2018. Phyllis was born in Woodston, KS, on November 13, 1938, to John O’Conner and Gladys O’Conner. Phyllis married Duane Glen Drake on June 10, 1955. They had four children, Deborah Sue Dove, Deandra Kay Standridge, Michael Duane Drake, and Stephanie Leann Price. After the death of her husband, Duane, on November 26, 1978, Phyllis returned to work full time as a cashier for Goodners Supermarkets. 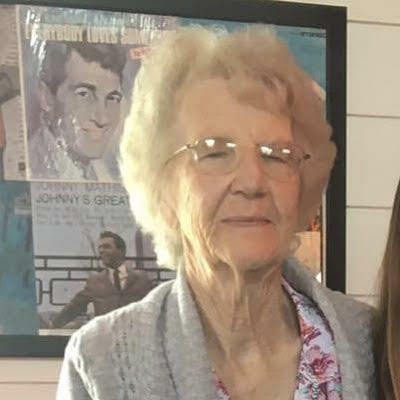 She remained employed at Goodners for over thirty years loving the interaction that she had with the customers and it did not take long for many of those customers to become friends with whom she remained in contact for many years. Phyllis relocated to Weatherford, Ok after her retirement and lived with her daughter, Stephanie. She was preceded in death by her husband, Duane, and her son Michael Duane Drake. She is survived by her children, Deborah Sue Dove, Deandra Kay (Randy) Standridge, Stephanie Leann Price. 11 grandchildren. 17 great-grandchildren. I loved Phyllis, she was a great card partner. I have many great memories of her. I know she is happy and at peace in the arms of Jesus! She will be greatly missed. Y’all are all in our prayers. Love you girls! I am sorry to hear of her passing. I have many memories of her as a cashier at Goodners. She was always smiling and as nice as can be to all of her customers. What a sweet woman! Prayers for all of the family. We knew her many many years and she was a great person. Loved her and sending prayers to the family. God Bless. She was married to the brother of my sisters husband David. So sad to hear she is gone. My thoughts and prayers to the family during this difficult time.